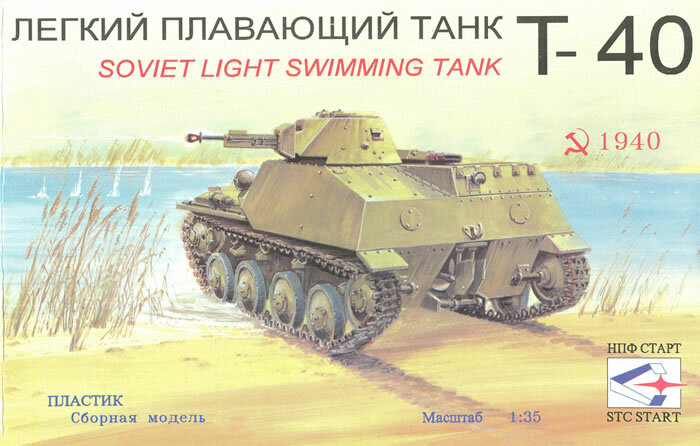 When the Soviet Union picked its six necessary classes of tanks in the early 1930s, one of the first ones was a light amphibious scout tank for battlefield reconnaissance. After the failure of the T-33 prototypes, they did successfully produce first the T-37 and then the improved T-38 tanks in this class. But the tanks had only minimal buoyancy reserves – the T-37A needed kapok-filled pontoons for fenders to float – and so more seaworthy designs were needed. In late 1937 the Red Army tasked Nikolay Astrov of Factory No. 37 to come up with a better design. The new tank, Project 101 or the T-39, proved to be close but not perfect. A redesign emerged in August 1938 as Project 010 or the T-40. Prototype testing was carried out through 1939 of two versions (“Komsomolets” bogies versus torsion bars) and the new tank variant with torsion bar suspension was judged the winner. Production began in November 1939 and slow series production began. There were three variants of the new tank: T-40, armed with a 12.7mm “Dushka” and 7.62mm DT machine guns; T-30, armed with a 20mm ShVAK cannon and 7.62mm machine gun, and a T-40S variant – S standing for “sukhoputniy” or land only. The latter two were non-amphibious. But they were tall and awkward in action, and even though reliable they were dropped after about 700 were built in favor of the lower and cannon-armed T-60 light tank; while not amphibious it was what the Red Army felt it needed. The T-40s served until they were mostly lost via either attrition or combat. 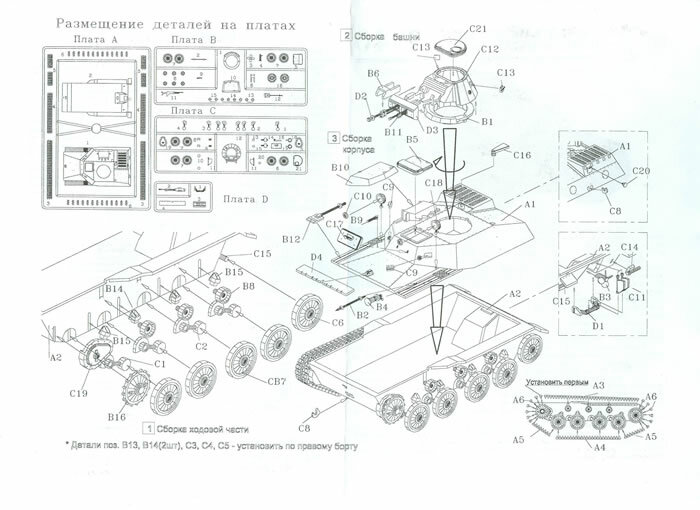 About 14 years ago START, one of the smaller Russian model companies to spring up after the demise of the USSR, produced four kits of these tanks: the T-40, T-30, T-40S and a prototype of the RS-82 armed self-propelled rocket launcher version of the T-40. The kits looked the part and were better than some early East Bloc kits in regard to accuracy and ease of assembly. I recently started working on a corrected T-40 and as such decided to relook the kit in the light of today’s detail-intensive kits. The three tank models COULD have been released as a single kit, as all of them share the same basic components and only differ in armament and a cover over the “niche” for the propeller and rudders. Since START wanted to extend their variety they ensured each kit was released separately with the correct parts for that variant. The kits are dimensionally and shapewise fairly accurate, other than the fact that the lower hull plate at the front of the hull pan is too short and steep; the plate should go from the angle joint to just behind the first set of road wheel arms. The details as noted are “soft” and that includes the fact that while much of the T-40 was welded, the lower hull was riveted as were the upper hull plates to the top of the hull. Key access parts were bolted together and all of this is either understated or missing. If you want to detail the belly of the tank, it requires the fittings for the ends of the torsion bars and about 350 or so rivets in two different sizes. The reasons for this are that the T-40 – like most light tanks – was assembled at a truck factory with little ability to deal with working or welding armor plate. The armor components were prepared at another factory (Izhorsk) and sent to Factory No. 37 for assembly. Another area needing detailing is the mounts for the idlers at the rear of the hull. The kit provides one-piece arms but they are missing the tension adjusting bellcranks. I replaced them with heavily modified road wheel arms from an Italeri M47 where the road wheel axle became the mount and the fitting connecting to the hull the new bellcrank. The upper hull is not bad but needs to have a new engine deck grill. There are seven louvers under a screen and these are only hinted at in the molding, so it needs to be removed and replaced with etched brass or extruded aluminum sheet and scratchbuilt louvers. The viewers are pretty much lumps of plastic and need to be replaced. On the real vehicle they are simple flip-up visors with three holes cut in the armor plate under them for visibility and not prismatic ones. The turret is not bad but the “Dushka” is soft and should be replaced if possible. The kit gun CAN be used but it takes a lot of filing, sanding and futzing around to get it right. Photo evidence shows nearly all of the tanks were fitted with the original DShK gun and not the later DShKM. The main difference externally is the “tulip” shaped muzzle brake on the “Dushka” and the twin-plate type on the “Dushka-M”. Also, the cradle/guard for the machine gun is wrong as it has a brace on the top vice a tray on the bottom as actually used on the T-40. Tracks are “link and length” but the long upper run will need careful bending to represent the slight sag shown by vehicles in service. No finishing directions are provided but the tanks were painted 4BO green overall (roughly FS34102 shade green) with black tracks as they left the factory. What photos of tanks in service exist show them either whitewashed for winter or green with two-digit bort numbers on the sides or rear of the turret. Overall it is not a bad little kit, and for those given to what the model car buffs call a “slammer” or “curbside” it can make an easy two day project. For anyone wanting a truly accurate model it provides a nice “canvas” to work on.